View of a tree-topped mound near Clayworth, Nottinghamshire. The mound is likely to be Beacon Hill, near the village of Gringley-on-the-Hill. 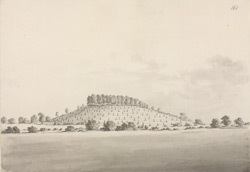 White's Directory of 1853 reports: "Near the village are several swelling mounds, which were it not for their size, might be supposed artificial from their very bases. On them, however, there have been thrown up three others in ancient times, a small one to the west of the church, and two large ones on its eastern side, one of which is called Beacon Hill".